Whatever it is called, Frume Sarah does not approve. Before I start getting comments like “it’s a lovely gesture,” “lighten up,” and “what’s the harm?” let me say that I have nothing against the Royal Couple. They should live and be well. In fact, I intend to rise at some unGodly hour and watch the Royal Wedding, as I did some thirty years ago. My feelings towards this “ketubah” are similar to those of Sandra Bullock’s son having a “bris.” In both cases, we have a ritual article and a ritual practice being reappropriated by non-Jews. And I am not comfortable with that. Many years ago, I attended a seminar that included a panel of religious leaders from a variety of faith traditions, discussing interfaith weddings. I was profoundly disturbed by the presentation made by a minister from the Unitarian Universalists. She talked about creating a ceremony that drew from many different faith and spiritual traditions. Like a patchwork quilt. A bisl of this, a bisl of that. As they say, a bisl un a bisl, vert a fule shisl [a little and a little and it makes a full pot.] OK — she didn’t actually say the “bisl” part, but you get what I mean. My emotional response was like one who had something forcibly taken. What gives one religious community the right to take a religious practice from another faith tradition and use it completely out of its original context? The original intent of the ketubah was not to be “commemorative”; it was, and is, a legally-binding document. I know that many Jewish couples choose an English rendering that is flowery and inspiring and, as Jews, that is their right to knowingly select a more contemporary, vernacular language. If the artist wanted to gift the couple with something Jewish, what about a lovely Birkat HaBayit instead?? I don’t know bupkes about this specific case, but I actually don’t have a problem with people respectfully trying rituals from other people’s faith traditions if it leads them to greater spiritual wholeness/happiness. Plus, it’s probably how we got the sukkah to begin with, one of my favorite Jewish rituals of all. You raise a good point here, Amy. It certainly troubles me when Jews do it. But at least, in theory, it is theirs to change. I agree. The appropriating of practices from other faiths presumes that those other faiths were somehow immune from doing the same thing themselves. As we should all know by now, much that is packaged as Christianity was itself a patchwork quilt of other practices and traditions. Who these days is offended by that? Religion — all religion — Unitarian Universalism or otherwise, is a human construct, pure and simple. It is subject to the same human imperfections, weaknesses and temptations, including the tendency to borrow from other faiths and claim it as one’s own. To their credit, the Unitarian Universalists make no bones about what they’re doing. Unlike other faith-traditions, they’re totally honest about it, right up front, no pretense. If only all religions could be so forthcoming. Regarding the personalizing of marriage ceremonies, what could be more sacred or more meaningful than that? My religion and its rituals are not up for the taking. And in this case, in particular, there is absolutely no reason for two non-Jews to have anything that even appears like a legal text that is hallowed by the Jewish religion. I think the harm is that people are going to think this is what Jews do and that leaving out the “Jewish religious stuff” is somehow ok. It’s like white people taking on Native American rituals. I understand the intent, but changing some of this, giving a different meaning to some of that, makes it NOT what Native Americans do. Why couldn’t the artist do up an artistic rendering of a blessing or a saying, instead of this? Exactly! The Birkat HaBayit (Blessing of the Home) would be an appropriate gift for any home. The ketubah speaks specifically about a Jewish home being established by the kiddushin (santification) of the couple, through the sacred rites at the chuppah. And good point about not taking on another ritual and then infusing it with different meaning. Well, I think they have a right to do whatever they want, but that said I think it’s disrespectful to Jews and Judaism. When two Jews marry with a ketubah, we are doing it according to the laws of Moses and Israel. It’s specific. I can understand how a Christian who believes the “new covenant” of the New Testament replaced our covenant from Mt. Sinai might have no problem with appropriating our rituals. But I believe that nothing can replace our particularistic covenant. And for others to pretend it’s okay to do that is, in my opinion, akin to saying that our covenant is irrelevant. It rubs me wrong and I totally agree a wedding or home blessing would be more appropriate. And I think it’s different from reinterpreting rules for mikveh or Sabbath observance because among the Jewish streams we have some serious philosophic differences about the role of oral law/halacha. Very good points here, Meira. Again, for those who are Jewish, we have a certain right to work within our own ritual boundaries — especially as we seek meaning and purpose — that simply doesn’t extend to those outside of our covenental community. Thank you for artfully raising this conversation. Your comments are insightful and really caused me to question where I stand on this issue. So Thank you. As of, I feel powerfully ambivalent. The Ketubah certainly began as a legal document and was intended to be one of the 3 ways in which a Jew acquires a female Jewess (to use the internal language to our document). I find the acquisition aspect repugnant and find myself dawn away from the traditional language to some of the other texts. This being said, perhaps all of the above mentioned thoughts are besides the point. Ketubah no longer functionally as a marriage contract for most liberal Jews with whom I am in contact. Those who opt-in to ketubah do so for the sake of art, as a beautiful commemoration of their marriage, or as a beautiful expression of their relationship with the Holy One. If so, why then no non-Jewish ketubah? Good question. Part of me says, wonderful! If Ketubah can be meaningful for you, then go for it! The part of me that’s holding back is personal. My ketubah not only reminds me of my sweetie, our love and our commitment. My ketubah also reminds me that our relationship and our obligations to one another is embedded in a Jewish context. Ketubah then reminds me that our human relationship is informed by our Jewish values. Yet, this is only me. 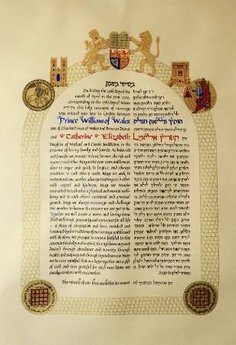 If my two non-Jewish friends who love each other and are committed to each other want to proclaim or commemorate their commitment with a beautiful piece of art which speaks of their love and their mutual obligations, why should I oppose it? At this point, I feel bereft of reasons to oppose such documents, even though it feels new, strange, and a little uncomfortable for me.